One of the most consistent trance labels of the past few years that always look to push new names and faces onto the scene are Enhanced Recordings. They’ve a well mixed balance of experience and new blood in the stable and for taste of what they have to offer their annual label compilation is just the job. They compile the very best of what the label has to offer and let the tracks loose for two of their in house artists to mix up for you. For the third edition of this ever engrossing series they have picked two beauties to do the business. Daniel Kandi and Estiva (Other wise known as Steven Baan) are two artists you can say have very much established themselves as two of the front runners on the trance scene. Their blend or euphoric sounds and mix of styles, looking to import something fresh into every release has brought us some beautiful music over the years. We had the chance to have chat to both of them about the new compilation and what’s in store for 2013! 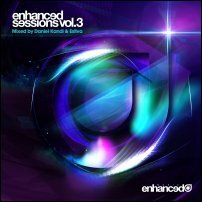 i:Vibes: Daniel and Steven, both of you have mixed Enhanced Recordings vol 3. How excited are you both about the release and what can we expect from the CD? Daniel: I must say I’m happy to see preorders went well and that it’s selling well now. So very happy! Steven: Compiling this cd was such a great project, we had a big amount of exclusive material. I felt really cool to have acces to all of the material and to actually gather the tracks that I loved and mix them onto one cd! I think the double cd blends so well together. We both managed to grab the essence of our styles! i:Vibes: Daniel, you started your magical producing career in 2006 on the well known Anjunabeats label and have released on Enhanced also in the last years while Steven you are a Enhanced Recordings hero having released on this label since 2007. What makes this label so special that is different from so many of the other trance labels out there? Daniel: The fact that I don’t box my artists. That thing about having all tunes conform into one sound is just silly. Sure it has to make sense compared to previous releases but still with an open mind to other sounds. Steven: Enhanced has a certain sound that really stand out to me. The consistency in releasing quality tracks within the wide spectrum of the trance genre is unmatched. i:Vibes: Enhanced Recordings is a label like Anjunabeats for me where I am always excited for the next release like a little kid getting ready to go down the stairs on Christmas to open his presents. Is it one or two massive hits that will finally move this label to the next level with the bigger labels or is it already there? Daniel: It takes a while to grow. I never intended for Always Alive to be the next Mau5trap, as trance and progressive in the styles that I release ain’t really for the whole world, but it is great music imo. So I hope it keeps growin’ as much as possible. Steven: When you're such a strong brand as Enhanced is nowadays you will have people like you that are eagerly waiting for what's next to be released. People know the artists and their sound but they're still ever so curious what's next. I don't think it's necessarily big hits that bring a label fame. It's about the dedication of the fans that you will earn by being consistent in quality and showing the love for music we all have. i:Vibes: Steven it has been three years since you last mixed a CD and it was the Enhanced Sessions Vol 1 with Temple One. How has your djing sound and style matured and developed since then? Steven: Since I very much developed as an artist, I've gained a lot of experience in dj'ing, you'll hear more club beats rather than songs you listen to at home. The love for unique melodies is strong so that hasn't changed at all. i:Vibes: Who could forget your beautiful work with Temple One on November Lovely. Are there any chances of these two talented producers making a track together again? Steven: Thank you! I love collaborating and I've had a great experience in working together with Joe so we will see what the future brings! i:Vibes: Daniel, this is your second mix cd after last years Anjunabeats Worldwide 3 with Arty. How more challenging was it compiling this playlist which has more unknown artists then your mix on Anjunabeats? Daniel: It wasnt that challenging in the sense that I knew what I wanted it to sound like. The challenge lied in getting as many good fitting transitions, so it all merged into one great mix. i:Vibes: Daniel what was your first reaction after hearing the amazing uplifting Ambrosia (Original Mix)) from Mike Danis & Johnny Yono? Are you a guy that falls in love with a track after one listen or does it take more time in general to fall in love with a track? Daniel: Sometimes it takes more time. This one took a bit extra, but I get it now! i:Vibes: Daniel you added Sometimes I wish from Texas group Tritonal. Fans first got a taste of their talent in 2007 with their Anjunabeats release Lights over Austin. How have you seen their sound development come along in the last years? Daniel: Gone from being those no one knew, to being a good household name on the biggest festivals around the globe! i:Vibes: Daniel with your three strikes ur in, you have departed from your more melodic sound form past releases. After three strikes where are you in according to this track? i:Vibes: Daniel how much do you enjoy making vocals tracks in 2012? Change the world turned out fantastic with Sarah Russell. What remains the most challenging thing on vocal tracks for you? Daniel: It’s very different to work with, when you KNOW it is your track, and not someone elses. So it was tough to be fully satisfied. But I like the result! and people love it when I play it out! i:Vibes: Daniel what new releases can we await from you in the coming months? Daniel: 128 electrance tunes with a good new friend of mine Jack Rowan and some quality trance in the upper bpm region too! Check youtube (danielkandiTV) for the latest preview! i:Vibes: Steven you added Aquamarine form Temple One with whom you have worked with? He keeps cranking out monster tunes. How has his sound developed in the last three years? Steven: Joe is a brilliant producer with a very creative mind. He always manages to surprise me with his emotional melodies. I love that he has been putting out some more progressive tunes as well since the pure uplifting 138BPM trance usually don't fit in my sets! i:Vibes: Steven how do go about preparing your mix for this CD? Did you think about many track combinations before making the final mix or how did you decide for this sound mix? Steven: There were so much material to choose from! In the first place I've chosen the tracks I immediately loved. Then it was a matter of finding the right balance in the mix. I think it's cool that you can hear a wide variety in my mix. i:Vibes: Steven please explain how you came to making Smiley Smilesworth? The name definitely has one remembering the name. Steven: Smiley Smilesworth was an unfinished project for a long time. From time to time Will Holland and I go through a few projects like that and then we decide what's really worth to work on. This was one of them. I like names you'll remember, names that stand out. This title was on my 'titles list', it came about in a funny conversation Will and I had. i:Vibes: Steven how was the collaboration with Arielle Maren on Wait Forever. What was the production time on this track? Steven: I was so excited to work with her, she has an amazing voice. The hook was very catchy and that made the production of this song so much easier! It's hard to tell the exact time I've been spending on it but it must've been a day or three! i:Vibes: Steven did Take Off from Ost & Meyer give you goose bumps in the break or did this track take longer to grow on you? Steven: Take Off is one of those spine tingling tunes. It starts with a rather clubby beat and groove. The breakdown is so smooth and subtle, the strings and piano will indeed give you goose bumps. This track got me right away. i:Vibes: Steven what was the most difficult thing that you had to perfect to get Cliché just right for you? Steven: Cliché has been the most complicated production ever to me. There's so many little unique things in this track that took a lot of production time. I really had to push myself to get these right because it makes the whole production stand out. It was worth it in the end! i:Vibes: Steven what releases can we await from you in the next months? Steven: 'Wait Forever' has just been released, which I made together with Cardinal and Arielle Maren. Since I'm very productive at the moment you can expect both vocal tracks and instrumental tunes. There is a loooot coming. More than ever! i:Vibes: I remember seeing you too guys back to back in the Technoclub in May and June of 2010. When will you guys be back supporting Talla 2XLC in his legendary club night in Frankfurt Germany? Daniel: Whenever he wants us! Steven: It seems so long ago already! I'd love to come back and I hope to see Talla somewhere around the globe to properly catch up with him! i:Vibes: Which style of music were you into before trance captured you? i:Vibes: What can people expect from the new mix album you guys recently released on Enhanced? Steven: His dedication to the music he loves so much. It's heartwarming! i:Vibes: What is your DJ Dubstep name on Hammarica.com? Steven: DJ Faderlove Loop Bass Wobbler! Hilarious! I hope it's still available. i:Vibes: Do we owe it all to Armin, or do we owe it to the Trancefamily? Steven: We don't owe anything to anyone. It's just the love for music that's so strong! Obviously the fans, Armin and other artists are extremely important to make a genre like trance big. i:Vibes: Would something like Brotrance (the trance varient of Brostep) be something we can expect in the future of trance? Steven: I've never heard of this title but it sound pretty funny. I think anything is possible nowadays. A lot of producers are experimenting and sometimes with awesome results! We can expect anything nowadays. i:Vibes: Ferry Corsten has recently remixed Just Bieber and Afrojack put his hands on Gangnam style. Would you do the same? Steven: Absolutely. I may seem strange to say this but for a producer it's so much fun to take something completely different and turn it into something that suits your sound! i:Vibes: Your plans for 2013? i:Vibes: Most awesome moment from 2012 while touring? Steven: Realizing what I'm actually doing.